The more I use Google Home, the more I want to do with it. It’s become second nature for things like the time, weather and shopping list, and now for my to do list as well. I use Asana for both work and personal task management and I just integrated the two, here’s how. First off, you’ll need an IFTTT account. Next, create an applet with Google Assistant as the ‘This’ choosing ‘Say a phrase with text ingredient’. Choose Asana as the ‘That’ with ‘Create task’ as the action. 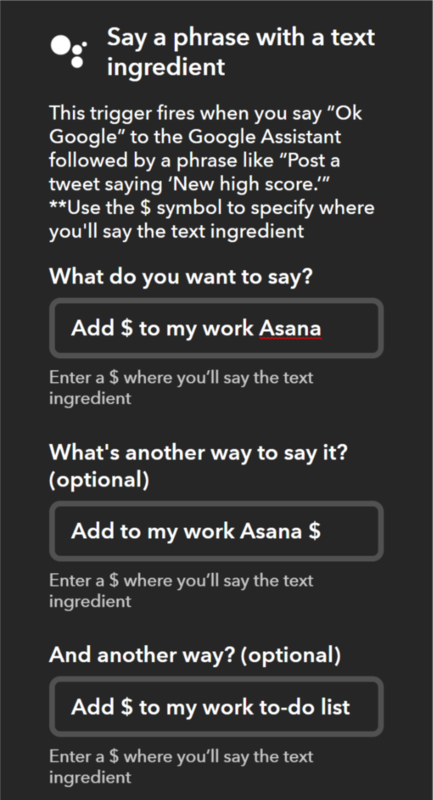 In IFTTT write “Add $ to my work Asana” where $ becomes the task name. To use this you’d say “Add get cleaning supplies to my work Asana’ and ‘get cleaning supplies’ would get added to your work Asana. What’s pretty handy is that you can set up to 3 different ways to say the phrase so you could have “Add $ to my work Asana”, “Stick $ on my to-do list” and “Put this on my to-do list $”. One thing I noticed is that when I used the ‘to-do list’ phrase, Google tried to put stuff on my shopping list instead of Asana. For the Asana integration, you need to choose a project. My work Asana organisation had loads of projects and my personal one had none. I tried to use ‘My Tasks’ for both and it didn’t work. You therefore need to either type the name of an existing project (verbatim) or create a new project in Asana and then type it’s name verbatim. I chose to create a new project called GA Tasks and also set it to assign the tasks to me so that they would appear on My Tasks regardless of the project. Thanks to this post for giving me the inspiration and direction.